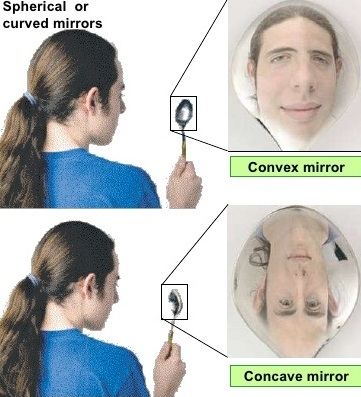 The concave mirror is a converging mirror , so that it is used for many purposes , It is used as a torch to reflect the light , It is used in the aircraft landing at the airports to guide the aeroplanes , It is used in shaving to get an enlarged and erect image of the face . The concave mirror is used in front lights of cars to reflect the light , It is used in marine lighthouses that are found at the marine ports and at the airports to guide the ships and it is used in the solar ovens . The concave mirror is used in the solar ovens and the solar furnaces to collect a large amount of solar energy in the focus of the mirror for cooking food , heating water , recharging power backups or melting metals respectively . Concave mirrors are used in satellite dishes , They are used in telescopes , Dentist and ENT doctors use them to obtain a larger image than the original of the teeth , ear or skin etc . Concave mirrors are used in the electron microscopes and magnifying glasses , They are used in the visual bomb detectors and they are used in the flash light mirror of camera . The real image is formed as a result of the intersection of the reflected light rays , It can be received on a screen and it is always inverted . The virtual image is formed as a result of the intersection of the reflected light rays extensions , It can not be received on a screen and it is always erect ( upright ) . The focus of the concave mirror is produced due to the collection of the reflected rays emitted from a far object such as the sun , The rays after being reflected collect in one lit point which is called the focus of the mirror that can be received on the screen . The distance between the focus of the mirror and the pole of the mirror = ½ the radius of mirror curvature and it is called the focal length of the mirror . When the incident light ray parallel to the principal axis , It reflects passing through the focus , When the incident light ray that passes through the focus , It reflects parallel to the principal axis , When the incident light ray that passes through the center of curvature , It reflects back on itself . When the position of the object is very far , the position of the image is at the focus , The image is real and very tiny ( dot ) . The object is at a distance greater than the radius of curvature ( after the center of curvature ) , The image is at a distance greater than the focal length but less than the double of focal length ( between the focus and the curvature ) , The image is real , inverted and diminished ( small ) . When the object is at the center of curvature ( at a distance equals the radius of curvature ) , The image will be at the curvature center , The image will real , inverted and equal to the object . When the object is between the center of curvature and the focus ( at a distance more than the focal length but less than the radius of curvature ) , The image is after the center of curvature ( at a distance greater than the radius of curvature ) , The image is real , inverted and enlarged ( magnified ) . When the object is between the focus and the pole ( at a distance less than the focal length , The image is behind the mirror , The image is virtual , upright ( erect ) and magnified . When the object is at the focus , No image is formed , The image is at infinity where the rays penetrate as parallel . The convex mirror is used as side-view mirror on the passenger’s side of a car because it forms an erect and smaller image for the way behind the car . The convex mirror is suitable for convenient shop and big supermarket and any other corner where need anti-thief , It is used in the turning off the road and parking . Convex mirrors are used inside the buildings , They are also used in making lenses of sunglasses , They are used in magnifying glass , They are used in securities and they are used in telescopes . They can be used as street light reflectors because they can spread the light over a bigger area , They are put on the corners of roads so that you can see any cars coming to avoid the collisions and they are used as ceiling dome mirrors . Wherever the position of the object in front of the convex mirror , the image is smaller than the object , It is upright ( erect ) , It is virtual ( not received on a screen ) . tnq very much it helped me very well thank you!!!! Thnks for helping me?. Gud explanation.? Thanks for helping me out of the canfusion ???????????? very nice! can you tell about spherical lenses too?